Former Cardiff City striker Robert Earnshaw says losing Fraizer Campbell would be a "big blow" for the Bluebirds. Leicester City have triggered a release clause in Campbell's contract by offering a sum close to £1m. "It would be a big blow," said Earnshaw. "He's done very well in all his time here... if he goes then Cardiff are going to lose his motivation, his drive and his work rate." 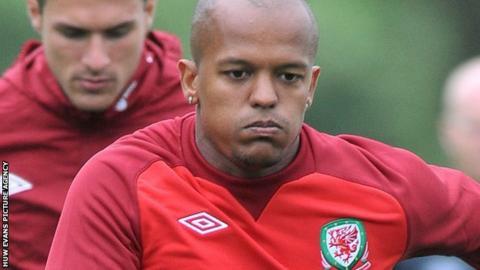 The 33-year-old Wales international Earnshaw is a free agent, having been released from his Blackpool contract in May. Campbell has scored 16 goals in 52 appearances for Cardiff City since signing from Sunderland for £650,000 in January 2013. "He's scored some crucial goals, so obviously he's a very good player," said Earnshaw. "Fraizer scored some goals and Cardiff are a good team to play at, so he leaves his print on the team. "He's done very well in all his time here, he puts the effort in which is one thing you have to have. "It's going to be difficult." Cardiff have signed three forwards since the end of the season, bringing in Javi Guerra and Federico Macheda on free transfers, as well as signing Adam Le Fondre from Reading. Earnshaw singled out Le Fondre as the player who can replace Campbell. Adam Le Fondre has scored 41 goals in 110 appearances for Reading. "He's [Le Fondre] one player that I rate highly. "I think he's a very good goal-scorer, very sharp and I think the fans are going to like him. "He's going to score goals because he's a very good finisher, which is going to be crucial if Cardiff are to go back to the Premier League next year. "I think he's going to have to score a lot of goals for the team, he's going to have to play well and be the edge that Cardiff need. "Le Fondre can fill those [boots]." Originally from Zambia, Earnshaw has won 58 caps for Wales but has not appeared for the national side since the friendly against Bosnia-Herzegovina in August 2012. Speaking to BBC Wales, he confirmed that national team selection is still on his mind. "I want to point out I'm not a former Wales international," said Earnshaw. "I'm still available, I think everybody's forgetting a little bit. "I may have been out of the country for a year or so, but I'm not a former Wales international. He added: "I want to be involved [in the Wales squad]. "I'd like to be a part of that squad, not just to play, but I want to score more goals for Wales."